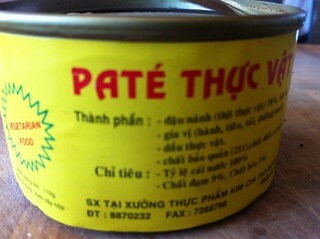 I bought this pate back with me from Vietnam earlier this year. I love Banh Mi and although vegan versions usually use a protein such as tofu or seitan, I noticed that a lot of the non vegan versions we saw used pate for the main ingredient. I did plan to try making some but had no idea at all what taste I should be aiming for. I love browsing round supermarkets on holiday and the one I went in had a whole section of vegetarian food. I couldn’t work out what much of it was, and I didn’t have much room in my case, but one of the items I picked up was this pate. It’s sat in my cupboard ever since, because I only make this version now, so I decided to use it today for super speedy Banh Mi. I used pate, cucumber, pickled carrot and daikon (a version from the forthcoming Vegan Eats World, which is a permanent staple in my fridge now), coriander, mint and lots of sambal oelek. The pate was very rich which was good because it contrasted very well with the pickles and spice. I don’t know how I’d recreate this pate, I can’t read the ingredients, and it’s obviously not something I’ll be able to get again very easily. 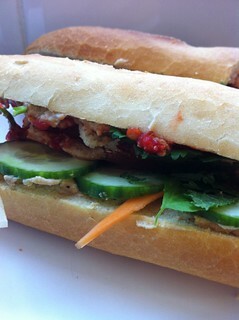 But, it did make a very good quick sandwich and in my book there’s no such thing as a bad Banh Mi.